Green Acres where the selection of pumpkins was huge and somewhat "pumpkin patchy". The bonus of waiting so long is that they were all buy one get one free....what a deal! 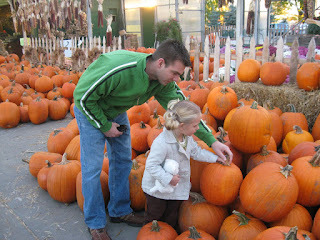 I think Dave and I had just as much fun as Jenna trying to pick out the perfect pumpkin. 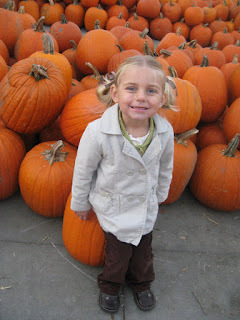 Our little softhearted Jenna even found a soft spot for the really ugly pumpkins. 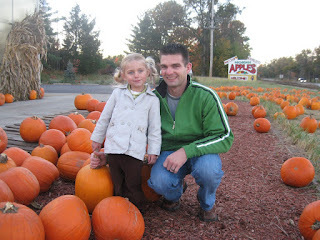 She had her choice of every huge and perfect pumpkin but she kept picking the smallest, misshapen, dented and damaged ones...gotta love a girl who sees the beauty in everything. They have other little treats in the store as well and Jenna used her smile and "please Dave" to get herself a bag of homemade Carmel corn...such a pushover - haha. I don't know why Jenna was in such a weird smile mood. We'll carve later in the week, I'm sure it will be a great time.